This article is about the Phrygian headgear. For the medical term, see Phrygian cap (anatomy). The Phrygian cap or liberty cap is a soft conical cap with the apex bent over, associated in antiquity with several peoples in Eastern Europe and Anatolia, including Phrygia, Dacia, and the Balkans. In early modern Europe it came to signify freedom and the pursuit of liberty through a confusion with the pileus, the felt cap of manumitted (emancipated) slaves of ancient Rome. In artistic representations it signifies freedom and the pursuit of liberty. By the 4th century BC (early Hellenistic period) the Phrygian cap was associated with Phrygian Attis, the consort of Cybele, the cult of which had by then become graecified. At around the same time, the cap appears in depictions of the legendary king Midas and other Phrygians in Greek vase-paintings and sculpture. Such images predate the earliest surviving literary references to the cap. By extension, the Phrygian cap came to be applied to several other non-Greek-speaking peoples ("barbarians" in the classical sense) as well. 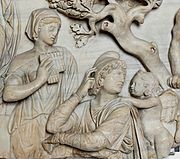 Most notable of these extended senses of "Phrygian" were the Trojans and other western Anatolian peoples, who in Greek perception were synonymous with the Phrygians, and whose heroes Paris, Aeneas, and Ganymede were all regularly depicted with a Phrygian cap. Other Greek earthenware of antiquity also depict Amazons and so-called "Scythian" archers with Phrygian caps. Although these are military depictions, the headgear is distinguished from "Phrygian helmets" by long ear flaps, and the figures are also identified as "barbarians" by their trousers. The headgear also appears in 2nd-century BC Boeotian Tanagra figurines of an effeminate Eros, and in various 1st-century BC statuary of the Commagene, in eastern Anatolia. Greek representations of Thracians also regularly appear with Phrygian caps, most notably Bendis, the Thracian goddess of the moon and the hunt, and Orpheus, a legendary Thracian poet and musician. While the Phrygian cap was of wool or soft leather, in pre-Hellenistic times the Greeks had already developed a military helmet that had a similarly characteristic flipped-over tip. These so-called "Phrygian helmets" (named in modern times after the cap) were usually of bronze and in prominent use in Thrace, Dacia, Magna Graecia and the rest of the Hellenistic world from the 5th century BC up to Roman times. Due to their superficial similarity, the cap and helmet are often difficult to distinguish in Greek art (especially in black-figure or red-figure earthenware) unless the headgear is identified as a soft flexible cap by long earflaps or a long neck flap. Also confusingly similar are the depictions of the helmets used by cavalry and light infantry (cf. Peltasts of Thrace and Paeonia), whose headgear – aside from the traditional alopekis caps of fox skin – also included stiff leather helmets in imitation of the bronze ones. The Greek concept passed to the Romans in its extended sense, and thus encompassed not only to Phrygians or Trojans (which the Romans also generally associated with the term "Phrygian"), but also the other near-neighbours of the Greeks. On Trajan's Column, which commemorated Trajan's epic wars with the Dacians (101–102 and 105–106 AD), the Phrygian cap adorns the heads of Trajan's Dacian prisoners. The prisoner, accompanying Trajan in the monumental, 3 m tall statue of Trajan in the ancient Turkish city of Laodicea, is wearing a Phrygian Cap. Parthians appear with Phrygian caps in the 2nd-century Arch of Septimius Severus, which commemorates Roman victories over the Parthian Empire. Likewise with Phrygians caps, but for Gauls, appear in 2nd-century friezes built into the 4th century Arch of Constantine. The Phrygian cap reappears in figures related to the first to fourth century religion Mithraism. This astrology-centric Roman mystery cult (cultus) projected itself with pseudo-Oriental trappings (known as perserie in scholarship) in order to distinguish itself from both traditional Roman religion and from the other mystery cults. In the artwork of the cult (e.g. in the so-called "tauroctony" cult images), the figures of the god Mithras as well as those of his helpers Cautes and Cautopates are routinely depicted with a Phrygian cap. The function of the Phrygian cap in the cult are unknown, but it is conventionally identified as an accessory of its perserie. Early Christian art (and continuing well into the Middle Ages) build on the same Greco-Roman perceptions of (Pseudo-)Zoroaster and his "Magi" as experts in the arts of astrology and magic, and routinely depict the "three wise men" (that follow a star) with Phrygian caps. Paris of Troy wearing a Phrygian cap. Marble, Roman artwork from the Hadrianic period (117–138 CE). The "three wise men" with Phrygian caps to identify them as "orientals". 6th-century, Basilica of Sant'Apollinare Nuovo in Ravenna, Italy. In late Republican Rome, a soft felt cap called the pileus served as a symbol of freemen (i.e. non-slaves), and was symbolically given to slaves upon manumission, thereby granting them not only their personal liberty, but also libertas— freedom as citizens, with the right to vote (if male). Following the assassination of Julius Caesar in 44 BC, Brutus and his co-conspirators instrumentalized this symbolism of the pileus to signify the end of Caesar's dictatorship and a return to the (Roman) republican system. In 1675, the anti-tax and anti-nobility Stamp-Paper revolt erupted in Brittany and north-western France, where it became known as the bonnets rouges uprising after the blue or red caps worn by the insurgents. Although the insurgents are not known to have preferred any particular style of cap, the name and color stuck as a symbol of revolt against the nobility and establishment. Robespierre would later object to the color, but was ignored. The use of a Phrygian-style cap as a symbol of revolutionary France is first documented in May 1790, at a festival in Troyes adorning a statue representing the nation, and at Lyon, on a lance carried by the goddess Libertas. To this day the national allegory of France, Marianne, is shown wearing a red Phrygian cap. By wearing the bonnet rouge and sans-culottes ("without silk breeches"), the Parisian working class made their revolutionary ardor and plebeian solidarity immediately recognizable. By mid-1791, these mocking fashion statements included the bonnet rouge as Parisian hairstyle, proclaimed by the Marquis de Villette (12 July 1791) as "the civic crown of the free man and French regeneration." On 15 July 1792, seeking to suppress the frivolity, François Christophe Kellermann, 1st Duc de Valmy, published an essay in which the Duke sought to establish the bonnet rouge as a sacred symbol that could only be worn by those with merit. The symbolic hairstyle became a rallying point and a way to mock the elaborate wigs of the aristocrats and the red caps of the bishops. On 6 November 1793, the Paris city council declared it the official hairstyle of all its members. The bonnet rouge on a spear was proposed as a component of the national seal on 22 September 1792 during the third session of the National Convention. Following a suggestion by Gaan Coulon, the Convention decreed that convicts would not be permitted to wear the red cap, as it was consecrated as the badge of citizenship and freedom. In 1792, when Louis XVI was induced to sign a constitution, popular prints of the king were doctored to show him wearing the bonnet rouge. The bust of Voltaire was crowned with the red bonnet of liberty after a performance of his Brutus at the Comédie-Française in March 1792. During the period of the Reign of Terror (September 1793 – July 1794), the cap was adopted defensively even by those who might be denounced as moderates or aristocrats and were especially keen to advertise their adherence to the new regime. The caps were often knitted by women known as tricoteuses, who sat beside the guillotine during public executions in Paris and supposedly continued knitting in between executions. [not in citation given] The spire of Strasbourg Cathedral was crowned with a bonnet rouge in order to prevent it from being torn down in 1794. In 1814, the Acte de déchéance de l'Empereur decision formally deposed the Bonapartes and restored the Bourbon regime, who in turn proscribed the bonnet rouge, La Marseillaise and Bastille Day celebrations. The symbols reappeared briefly in March–July 1815 during "Napoleon's Hundred Days", but were immediately suppressed again following the second restoration of Louis XVIII on 8 July 1815. The symbols resurfaced again during the July Revolution of 1830, after which they were reinstated by the liberal July Monarchy of Louis Philippe I, and the revolutionary symbols—anthem, holiday, and bonnet rouge—became "constituent parts of a national heritage consecrated by the state and embraced by the public." The republican associations with the bonnet rouge were adopted as the name and emblem of a French satirical republican and anarchist periodical published between 1913 and 1922 by Miguel Almereyda that targeted the Action française, a royalist, counter-revolutionary movement on the extreme right. The anti-tax associations with the bonnet rouge were revived in October 2013, when a French tax-protest movement called the Bonnets Rouges used the red revolution-era Phrygian cap as a protest symbol. By means of large demonstrations and direct action, which included the destruction of many highway tax portals, the movement successfully forced the French government to rescind the tax. 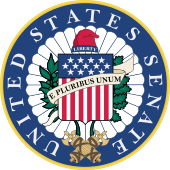 A Phrygian cap on the Seal of the U.S. Senate. In the 18th century, the cap was often used in English political prints as an attribute of Liberty. In the years just prior to the American Revolutionary War of independence from Great Britain, Americans copied or emulated some of those prints in an attempt to visually defend their inherited liberties as Englishmen. Later, the symbol of republicanism and anti-monarchial sentiment appeared in the United States as headgear of Columbia, who in turn was visualized as a goddess-like female national personification of the United States and of Liberty herself. The cap reappears in association with Columbia in the early years of the republic, for example, on the obverse of the 1785 Immune Columbia pattern coin, which shows the goddess with a helmet seated on a globe holding in a right hand a furled U.S. flag topped by the liberty cap. Starting in 1793, U.S. coinage frequently showed Columbia/Liberty wearing the cap. The anti-federalist movement likewise instrumentalized the figure, as in a cartoon from 1796 in which Columbia is overwhelmed by a huge American eagle holding a Liberty Pole under its wings. The cap's last appearance on circulating coinage was the Walking Liberty Half Dollar, which was minted through 1947 (and reused on the current bullion American Silver Eagle). The U.S. Army has, since 1778, utilized a "War Office Seal" in which the motto "This We'll Defend" is displayed directly over a Phrygian cap on an upturned sword. It also appears on the state flags of West Virginia (as part of its official seal), New Jersey, and New York, as well as the official seal of the United States Senate, the state of Iowa, the state of North Carolina (as well as the arms of its Senate,) and on the reverse side of the Seal of Virginia. In 1854, when sculptor Thomas Crawford was preparing models for sculpture for the United States Capitol, Secretary of War Jefferson Davis (a slaveowner and later the President of the Confederate States) insisted that a Phrygian cap not be included on a Statue of Freedom, on the grounds that "American liberty is original and not the liberty of the freed slave". The cap was not included in the final bronze version that is now in the building. 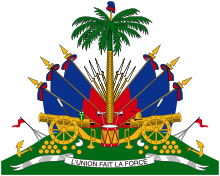 The coat of arms of Haiti includes a Phrygian cap on top of a palm tree, commemorating that country's foundation in a slave revolt. Coat of arms of Colombia includes a Phrygian cap as a symbol of liberty and freedom. Many of the anti-colonial revolutions in Latin America were heavily inspired by the imagery and slogans of the American and French Revolutions. As a result, the cap has appeared on the coats of arms of many Latin American nations. The coat of arms of Haiti includes a Phrygian cap to commemorate that country's foundation by rebellious slaves. In the Byzantine Empire, Phrygia lay in Anatolia to the east of Constantinople, and thus in this late 6th-century mosaic from the Basilica of Sant'Apollinare Nuovo, Ravenna, Italy, (which was part of the Eastern Empire), the Three Magi wear Phrygian caps in order to identify them as generic "orientals". Tinted etching of Louis XVI of France, 1792, with a Phrygian cap. Anonymous bust of Marianne, with the Phrygian cap (Palais du Luxembourg, Paris). Efígie da República (Effigy of the Republic), national personification of Brazil, wearing a Phrygian cap. The Seal of Iowa showing a red liberty cap at the top of the soldier's flagstaff. The 1847 written description did not specify that the soldier has to wear the cap; thus he is commonly depicted with a Civil War-era cavalry hat. The Seal of Hawaii showing goddess Liberty wears a red liberty cap. 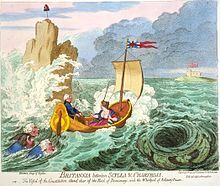 ^ "Britannia between Scylla & Charybdis. or..." Library of Congress. Library of Congress. Retrieved 7 January 2019. ^ Zeiler, Frank (2014). "Visuelle Rechtsverteidigung im Nordamerikakonflikt. Ein Beitrag zur Rezeption der englischen Freiheits- und Verfassungssymbolik in nordamerikanischen Druckgraphiken der Jahre 1765-1783, Signa Ivris, Vol. 13 (2014), pp. 315-346" (in German). ^ Gale, Robert L. (1964), Thomas Crawford: American Sculptor, University of Pittsburgh Press, Pittsburgh, p. 124.